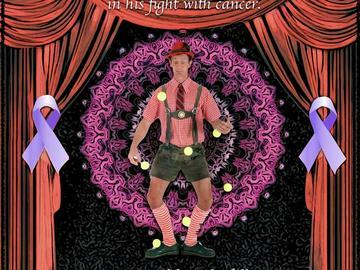 For one night only, an all-star cast of Renaissance Festival headliners come together as friends to help their friend, Johnny Fox, in his fight with cancer. As a magician and swordswallower, Johnny Fox has entertained audiences all over the world. He has also been a great friend, brother and mentor to so many of your favorite entertainers. Renn-comedy giants "Puke and Snot"
Hilby "the Skinny, German, Juggle Boy"
The hilarious "Hey Nunnie Nunnie"
Casey "Dash Rippington" Severn and Jim "Nymblewyck" Frank and Geoff "Captain Romero" Thompson of "Fight School"
The hilarious canine antics of "Mutts Gone Nuts"
...and the music of The Drumrunners! This is a volunteer event and all profits will go to help Johnny Fox with his expenses as he works to stay healthy and continue his contribution of laughter and amazement. This group will never likely be all in the same place ever again, we hope you'll join us! This event is "open seating" and tickets, if available, will be $35 at the door!